How many gardening magazines do you subscribe to? In my case, I’ve decided I subscribe to too many magazines, both gardening and non-gardening. I’m overrun with magazines, some stacked on the floor, some semi-organized in magazine holders, others in baskets waiting to be read. Everywhere I look, there are magazines. It is like the proverbial elephant in the room, all those magazines. 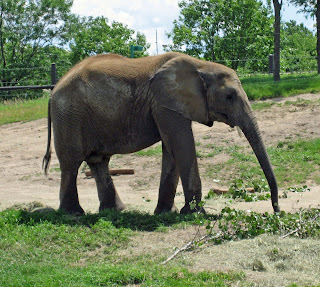 Hey, look there's the elephant! The magazines can no longer be ignored because as it turns out, there’s a limit to how many magazines can keep and how useful they are, even years later. So, spurred on by a “Plurk” from Robin of Bumblebee and the Examiner announcing that she was making last week “organizing week”, I decided to round up all the magazines and deal with them. Quite a few stacks, I know, and the picture does not include all of them. My older sister stopped by and took about 50 of them from me. Every time she picked one up and read out loud from the cover something like “Oh, this one has an article about Tasha Tudor, I’ll take that one”, I wanted to keep it. But I was strong. I left her the room and let her take what she wanted. Yes, there were a few back issues of a couple of the magazines that I wouldn’t let her take, like those Kitchen Gardener magazines, but for the most part, I told her to take what she wanted. There are a few other plurkers getting into the organizing spirit. After all, it is more fun when you know others are doing it, too. So far, Leslie at Growing a Garden in Davis is organizing her recipes and Cindy at My Corner of Katy is going through some of her files. Anyone else? I do actually like to have things more organized and straightened up, than the other way. I find it hard to work around clutter and disarray, unless it is straightened up “disarray”, or “disarray” that is in my control to straighten up. I think that’s why when I go out to the garden, if the grass is tall, I’ll mow it first, so I have a nice background to do the rest of the gardening! Less disarray! Well, maybe not, maybe I just like to mow the lawn. Anyway, I’m getting rid of old magazines and organizing those I decide to keep. Then this morning I looked at the new blog of a colleague and he’s beginning the “great household purge”. I need that! I’m going to do that, because getting rid of what I no longer need or want will make it easier to organize. Magazines. 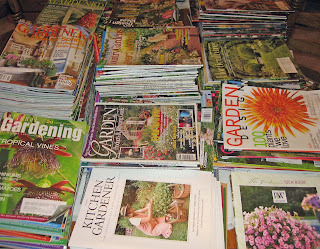 I’ll give away the gardening magazines that I don’t want with strict orders to pass them along or recycle them when they are done with them. And I’ll reduce the number of new magazines I get. If I have any subscriptions for magazines that I rarely read that go beyond one year, I’m going to write and ask them to cancel the subscription and refund the unused portion of it, and donate that to charity. I’m still going to subscribe to a couple of the magazines… just not ALL of them. Plastic pots. I think I know a greenhouse owner who will take used plastic pots. I’ll stop by and ask her this weekend if she wants them. Tools. Hey, let’s not get carried away with this. I’m not getting rid of the hoes, though there are a couple of worthless rakes I should get rid of and handful of trowels! Books. I’ve got all my gardening books cataloged on LibraryThing, so I feel like they are organized. I just need to do some rearranging of the bookcases to get them all to fit. And truthfully, there are a few I could get rid of. Catalogs. These go right to the recycle bin almost as soon as I get them, especially if I know I’m definitely not ordering from them. I need to find that place you notify to get your name off all the direct-mail marketing lists, so I get fewer catalogs, and do it soon before the Christmas catalogs start to arrive. Is anyone else interested in reducing stuff and organizing what’s left, especially related to the garden and garden shed? Feel free to join in, the more the merrier! 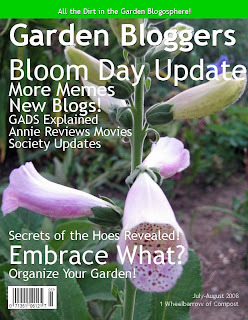 By the way, would you subscribe to that Garden Bloggers magazine shown above? Isn’t there a certain irony to subscribing to a printed magazine about online activities? Why, sure there is! And by the way, you know that’s not a real magazine, right? I made up that cover using this site. I love magazines so much, but they do accumulate. I admire your resolve! Catalogs are the worst, we call the postman the "reverse trash man" because he drops off trash instead of taking it away. I don't have magazines as many as yours. Actually, my mother only subscribes to an agricultural magazine, but I am the one who organized it. I keep some old issued magazines from my mother. Hope you succeed with your goal to organize your stuff. I only subscribe to 3 magazines now and I am really good about only keeping 2-3 mos worth at a time and donating the rest. Your fake magazine cover looks great by the way. Nice cover, Carol! I wonder what would happen if that magazine appeared on the shelf next to the grocery checkout - would people in line sneak peaks to discover the secrets of the hoes? When I first came to Texas I had a few garden magazine subscriptions, but I didn't renew them after they lapsed. Gardening here was too different from what was in the magazines - looking at the lush photos was painful and the information wasn't useful. So there are no magazines to organize here. The shed that desperately needs organization is too hot to work in and so is the garage ... how about organizing the digital garden photos inside the air-conditioning? Will that count? I saw that cover and thought, "What the ...?" Good one! I don't subscribe to any magazines at all anymore. But people at work bring theirs in (and catalogs) and leave them in the bathroom and the breakroom. That's a good way to share them. You could also take a big stack and go to any nearby hospital and leave a few in every waiting area. I subscribe to 3 gardening mags - having only just taken one on recently. I am now thinking of cancelling one of the others since it is a weekly magazine and I have a pile on the floor. Also I have found that as I become more knowledgeable my expectations of magazines have changed. Carol, good for you. Getting rid of 'clutter' can be so freeing. It can be hard, though. But be strong and in the end you will be happy. Start a file on your computer for magazine articles-they ones you know will be useful. Just copy directly into the file. something else to organize. I have started doing that with articles on crafts, cooking, etc. then you can give away more easily. I used to get several garden magazines then I found that they were repetitive. I let them run the subscription then didn't renew. If I find an article or picture I like I tear it out to save in my journal or I put it into a file folder I have. I even purged that this past winter. I go to the library to read several garden magazines that they subscribe to. If I find something in them that I can't live without and a b&w copy doens't do I purchase the magazine and tear out the article/picture I want. All of the magazines I have I pass along to family, friends or recycle. Oh yes it feels good to get the clutter out. At the mo I've no garden magazine subcriptions at all. Since I've been reading garden blogs I find most garden mags tedious and much less fun. Wow, that is a lot of magazines! But I can see how it can happen. My husband things this is Organization Month. We finished the garage. The basement will take a bit more time between gardening, writing and parties. But it feels very good to get some long-neglected organization tasks squared away. I'm glad we're doing this as a Plurking group! I have been going through all the homeschooling texts and paraphernalia and getting rid of things we don't use and aren't likely to. But I would save organizing in general for the winter months when there isn't a garden competing for my time. October is usually the month I go through winter clothing to see who needs what, and what has been outgrown and can be gotten rid of. I only subscribe to one gardening magazine, Texas Gardening and really I mainly subscribe to that one in order to read the monthly column by Greg Grant. A neighbor and I participate in a magazine exchange. Whenever either of us finishes an issue we immediately pass it on to the other to read. We just stick in the mailbox. Afterwards it is really easy to throw away other people's magazines. A long time ago I read somewhere that we usually keep magazines for only a few pages that we want to read or revisit so why not just remove those few pages before recycling or passing the publication on to others. That is what I do now, just rip out pictures or articles I like, file them and lose the bulk! I can't believe it - someone with more gardening magazines than I have! I guess that's because I'm down to only a couple of subscriptions now. The great household purge will have to wait until winter here. Then I won't feel that pull to go out in the garden & yank one more weed. Loved the fake magazine. The file organization proceeds, albeit a snail's pace. I have a bad habit of rethinking my organizational schemes, which frequently results in an overhaul of the previous scheme. I like change TOO much, I think! August should be a good month for me to get started on the Great Household Purge. The biggest decision is what to do with all the items I decide not to keep. I can't stand to throw away anything that might be useful to someone else. Books & magazines are easy enough to deal with, but what do I do with all the piddly stuff? I worry about donating it to a charitable organization or resale shop. Will it be trashed if they can't use it? I overthink things, I know. This is why, even in the evil month of August, I'd rather work in the garden! I really like that magazine cover tool. The results really look professional! A most worthy project, and one I should do myself. Dude, I'm at work right now and I'm like salivating over the idea of getting home and diving into my boxes of seed packets and plant tags... gotta get those under control. I subscribe to one garden magazine and have everyone of them since the premiere issue...they are on a bookshelf behind a closed door! This years are scattered about in various piles along with legal pads of garden ideas and blog posts half written. I tried ripping the pages out but they became a nightmare of organizing themselves...easier to keep the whole magazine and peruse new ones in the grocery line before putting them back on the rack! Too many repeat articles and ideas. My mosaic shed needs a good purging and organizing! Then I start on the laundry room...I do keep my seeds in there! Hi Carol, if you're looking to divest yourself of some magazines, interoffice them my way! : ) I'm trying to plan my backyard and am on the hunt for ideas. Seriously, I find that going through my stash of magazines about every two months and sending them to the hospital for the waiting rooms gets them out of my space and helps bide the time for others who are facing long waits. Just a thought. I have a problem with magazines myself, although I think I subscribe to fewer than you do. Any articles I like and want to keep get ripped out and saved in a 3 ring binder for future reference. The rest are given to schools for craft projects or are recycled. I'm working on organizing my craft stuff now, and my new garden shed. Okay, so it's not finished yet. Does that fact really matter? I only subscribe to one magazine, but I pick up a lot of magazines from stores and also get a lot of catalogues in the mail. Last night I was in a cleaning frenzy and actually purged most of them from my coffee table. It just feels so darn good to do! The recipes are nearing the end...although I need to go through some of the ones I filed years ago and clear out things I'd never make. This weekend I continue work in the garage...it's a long haul but bit by bit. I agree with Robin...plurk support will keep us going! Oh, I love how you emphasized recycling the magazines AND the nursery pots. Too many people think that if they don't have regular recycling that the trash is the only option. But even taking the mags to Goodwill is great and beats the landfill (at least for awhile). And I've found that MOST local nurseries will reuse the nicer garden pots. Fortunately, I've been "good" about gardening magazines. Gardening books. Ahem, well THAT is another matter entirely. Great post, as usual. Thanks for your hard work! All that talk about purging and organizing makes me tired . . .
My all time favorite gardening magazine is Country Gardens. I save my gardening magazines and look at them again in their appropriate season. Nice to know that others are also cutting back on clutter. I'm letting all of my subscriptions run out and am not renewing. It feels good not to have those all around. I take the old ones to work also. It's a great service that they provide. 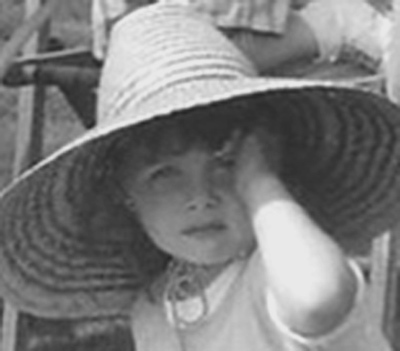 Some catalogs won't honor the request through them, but many do. I just rip off the back cover of the catalog with the codes when they arrive and sit down and enter several at a time. I have been trying to reduce my stock of magazines also. We have a used bookstore that takes them on trade so someone else can spend 25 cents and read them too. And I have a source of inexpensive magazines. Of course either I read to many or there aren't enough people cleaning out their collections. ha.